The Wardell Buffalo Trap, Smithsonian Site Number 48SU301, the earliest known evidence of a communal bison kill and trap involving the use of the bow and arrow on the Northwestern Plains (Frison 1978), was subject to excavations by the Anthropology Department of the University of Wyoming during 1971 and 1972. Research conducted at the site resulted in the discovery of post holes defining a trap perimeter, various hearth structures both within the bone bed and adjacent processing area, approximately 470 projectile points, pottery sherds, ground stone, the remains of over 230 individual bison, hundreds of tools (crafted from both stone and bone), and radiocarbon dates representing three distinct stratigraphic levels. In total, over 4 tons of archaeological material was recovered. These findings highlight the site’s significance and were the basis for a National Register of Historic Places listing (NRHP registered property number 49). 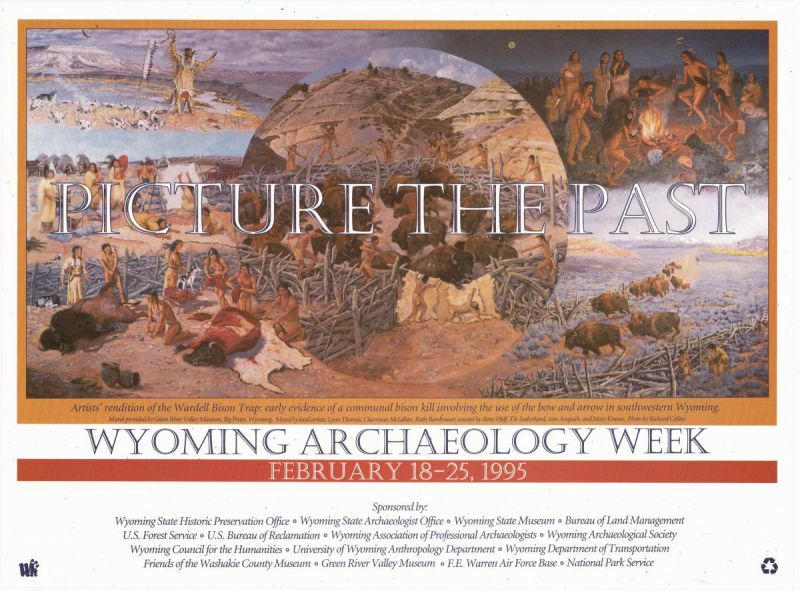 Additional information concerning the excavations of this NRHP eligible and listed historic property can be found in Prehistoric Hunters of the High Plains (1978 1st Ed., 2nd Ed. 1991) and The Wardell Buffalo Trap 48 SU 301: Communal Procurement in the Upper Green River Basin, Wyoming (1973) both written by Dr. George Frison. Recently, in Survival by Hunting: Prehistoric Human Predators and Animal Prey (2004) Dr. Frison rethinks the idea of Wardell being a pound only and adds that the hill to the north could well have been used as a jump. If as Frison suggests, the Wardell Site was used as both a pound and jump the significance of the location is immeasurable becoming one of a kind in North America. Continued research conducted at 48SU301 could lead to advances in further understanding prehistoric lifeways, bison procurement methods and communal kills. Placing 48SU301 in a larger site setting which encompasses the Upper Green River Basin settlement system is now possible. It should be noted that our further investigations within the Wardell vicinity smaller sites analogous to bison trapping have been located. Nearby a shaman structure can be incorporated into the overall site boundary. Several other rock alignment sites in the area (cf. Ross Butte, 48SU1820 and White Buffalo site) suggest that Wardell is a centrally located component of a large procurement system encompassing several thousand acres of landscape. National Historic Landmark listing can help quantify information from 48SU301 into an overall regional setting that is important to researchers on a national scale. Furthermore, the presence of pottery suggestive of Largo-Gallina and Navajo utilitarian pottery implies a possible Athabascan association as mentioned by Frison (1973, 1978, and 1991). This concept is far reaching and may lead to understanding prehistoric migrations from the north to south and the settlement and use of the Upper Green River Basin by this group for up to 500 years. New data utilizing thin section technology concerning sherds found at 48SU301 show they are made locally and depending on form may or may not be related to Athabascan groups from the north. As with any science, when new data becomes available innovative hypothesis can be drawn, thus another important factor pointing toward National Landmark status for the Wardell site and its availability to all scientists involved with migration patterning. Avonlea point types associated with Wardell also suggest the migration of people from the north. Avonlea people have been traced from Canada, through Montana and Wyoming and as suggested above may be related to the Navajo of the Southwest. Coordinated bison drives such as Wardell, imply a high degree of cohesive community organization in which the members of several different groups may have participated suggesting that numerous bands of Avonlea people may have inhabited the Upper Green River Basin. By utilizing and studying the different aspects of 48SU301 the lifestyles of these prehistoric people can be better understood. As with all studies of ancient lifeways, information pertaining to the present can become apparent and useful to interested parties across the country.